Network Attached Storage, short for NAS, is the extender for home sharing. Most of NAS owner would like to backup Blu-ray/DVD collection to NAS for more convenient playback via streamers like PS4, WD TV, Popcorn Hour etc, or stream all kinds of Media/Videos which downloaded from website. Actually, you need to convert all of your videos to NAS compatible video format first. This guide will show you anything about NAS backup and storage guides or tips for playback on HD Media player/home theatre for sharing with your families and friends with ease. Enjoy! A NAS is a very practical device for data backup and storage. That’s why you should leverage its capabilities to backup your computers in your network. This might seem to be obvious, yet many people only use their NAS as a better external hard drive for data storage which would be a shame. The key to success here is automation: if you’re doing your backups manually you’re making your life more difficult than it should be. If you’re using a Mac you can set up Time Machine to back up to your NAS location in your network. Just select the folder you want your backup to be stored in and start Time Machine. You can read our in-depth tutorial on how to backup your Macintosh computer. Especially for business it might be necessary to keep all the data under their control and not rely on third party providers like Dropbox (Editor Rating, 2 GB for 0 $/year) for file synchronisation. If you’re using a Synology DiskStation it comes with a feature called CloudStation which installs a folder on your computer that works as a centralized bucket for your files. If you save something in that folder it will get synced across all other devices that have that folder installed on their machines. You can access your files an a mobile. While you may have set up your NAS with RAID that guarantees redundancy of some sort if one of your hard drives fail you should think about how to backup your NAS files as well. This is a step many people do not consider necessary. However, a backup of your backup is crucially important to be prepared for disaster. It comes down to the question: “what if”. What if somebody steals your inventory including your NAS and you don’t have a backup copy of those files? What if there is some sort of accident that destroys your NAS and makes data unrecoverable? More what if’s could be asked, in the end it comes down to how much risk you’re willing to take and how many security layer you need for your personal or business data. If you’re using a Synology and Crashplan, you can install Crashplan onto that NAS and have it back up all its files to Crashplan Central. The installation is not easy, though, because the personal Crashplan (Editor Rating, Unlimited GB for 59.99 $/year) normally does not support NAS backup. Here is a good manual on how to do that. If you don’t like to hack your way around it, you may just want to subscribe to their business version. 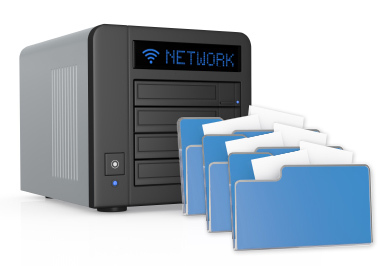 For home owners a network attached storage device may be the ideal way to manage media files. You can store your movies, audio files and pictures on your Synology NAS and have them automatically backed up. Fortunately, Synology just released their DSM 4.2 (DiskStation Manager) which has a lot of improvements. For example, you can stream your movie files directly to your AppleTV. You can playback videos anywhere and if you’ve enabled video conversion for mobile devices even on your mobile phone. It’s great for backing up all the videos of your toddler and show them to friends and family. If you’re not a Crashplan user or just don’t feel comfortable dabbling with the command line but still want to enjoy piece of mind you can install Amazon Glacier support with one click in your DiskStation. Amazon Glacier is a storage service offered by Amazon specifically for data storage so that it can be recovered in case of disasters. It is a lot cheaper than storage on Amazon S3 because the data is stored on tape (yes, that’s still a viable alternative to hard drives). But because it is stored on tape it takes longer to recover your files that’s why it should not be used as an active data storage facility. Just as a backup of your backup. The possibilities of a Synology DiskStation are endless. Just explore some of the things you can do with a DiskStation on their website. Even if you’re not a very computer savvy person you can get started right away. We got ours at Amazon and keep in mind that you need some hard drives as well. Which is the best solution to convert Blu-ray, DVD, video and edit them before streaming to NAS. 1. Top Blu-ray Ripper: For people who want to transfer Blu-ray movies to NAS, you may need to roll off disc protection, choose target video format and adjust the best video size/bitrate/frame rate for NAS. 2. Top DVD Ripper: You cannot miss a DVD to NAS Converter if you want to move DVD to your NAS. 3. Top Multi-track BD/DVD Ripper: Not tech-savvy but wanna transfer Blu-ray/DVD for watching with multiple languages on media players via NAS? Then a Multi-track preserving tool can finish your task within a few simple clicks. 4. Top Ultimate Video Converter: Need an excellent all-in-one solution to convert any media files, including rental or purchased Blu-ray, DVD, HD videos from Camcorders, all standard videos, online YouTube videos, TV shows, movies downloads etc for playing via NAS? All these can be solved with an easy-to-use video and audio converter. 5. Top DRM Removal: We can’t stream iTunes purchased or rented TV shows to NAS because of the Apple’s Fairplay DRM protection unless we have a DRM converting tool to strip the iTunes DRM protection, and then do an iTunes m4v to NAS compatible formats recording without quality loss.